The finals of the Brigade’s National Competitions take place between March and May each year, and we are pleased to share with you the results of the finals which have taken place so far this session. Members from 7th Edinburgh, 1st Bearsden, 1st Ardshaw and 1st Cheslyn Hay Companies showed skill, commitment and concentration in order to make it through the regional heats and compete in the finals. But the 1st Bearsden Company made all the right moves as they took home first prize at the National Chess Final held in Coatbridge on Saturday 25th March. John McEwan, Alistair Ramsey and Fergus Hempel from 1st Bearsden beat off the competition to be crowned overall winners following a tie-break with 1st Cheslyn Hay. Six BB teams made up of members from 1st Bearsden, 1st Polmont, 1st Guildford, 1st Cheslyn Hay, 1st Ardstraw and 4th Newtownabbey went through to the final, held in Belfast in April. 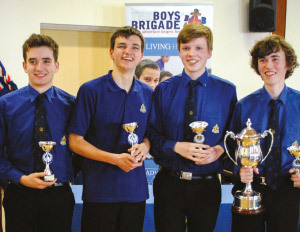 It was John McEwan, Greg Wood, Ross Brown and Fergus Hempel from 1st Bearsden who scooped this year’s championship in a quiz tournament which included rounds on general and biblical knowledge, famous landmarks, history and famous faces. The win by 1st Bearsden has provided double success for the company this year as its team clinched the national chess title last month. 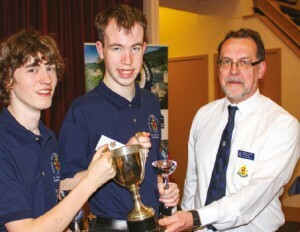 Two of the Masterteam team members – John McEwan and Fergus Hempel – were also part of the winning chess team. 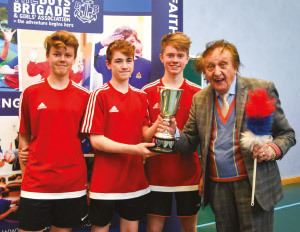 Liverpool Battalion hosted a thrilling day at the Ian Robinson Sports Centre in Liverpool as six teams from across the UK took part in the National Table Tennis finals. The 4th North West Durham Company were crowned winners, with 1st Grangemouth clinching the runners-up spot. It was a case of third time lucky as the team from Lanchester in Durham finished third in the last two outings. This year they worked well as a team, showcasing their skills, training and personal commitment, resulting in a win for Sam Humes, Matthew Grimes and brother Sam Grimes. Also competing in the finals were teams from 1st Monifieth, 1st Newport (Isle of Wight), 1st Ballyclare and 2nd Coleraine. The remaining competitions including Badminton and Five-aside Football will be reported on in the next issue.